Bacteria produce many glycosylated structures and polysaccharides, including polysaccharide capsule, teichoic acids, and N- and O-linked glycosylated proteins. The ease of whole genome sequencing has accelerated identification of the involved biosynthesis genes, but experimental data to support a gene-structure relationship is often lacking. By a combination of bacterial mutagenesis, glycoanalysis, bacteriological and immunological in vitro assays and animal infection studies, we aim to elucidate the role of surface glycans in bacterial infectious diseases. Our lab focuses on infections caused by two important human pathogens, Staphylococcus aureus and Group A Streptococcus (GAS). Both species are common harmless commensals of the skin and naso/pharynx but can also cause life-threatening infections1,2. The composition of the cell wall of S. aureus and GAS is rich in glycans, but their function has remained mostly uncharacterized. For GAS, the dominant cell wall structure consists of the Group A carbohydrate (GAC) or Lancefield antigen, which comprises approximately 50% of the cell wall by weight3. In addition to an essential structural role in the cell wall4, we have demonstrated that the specific N-acetylglucosamine (GlcNAc) epitope of the GAC contributes to pathogenesis5. Similarly, S. aureus expresses several glycosylated structures including GlcNAcylated wall teichoic acid (WTA) 6 and also glycosylated proteins7 that contribute to nasal colonization and systemic infection6,8-10. 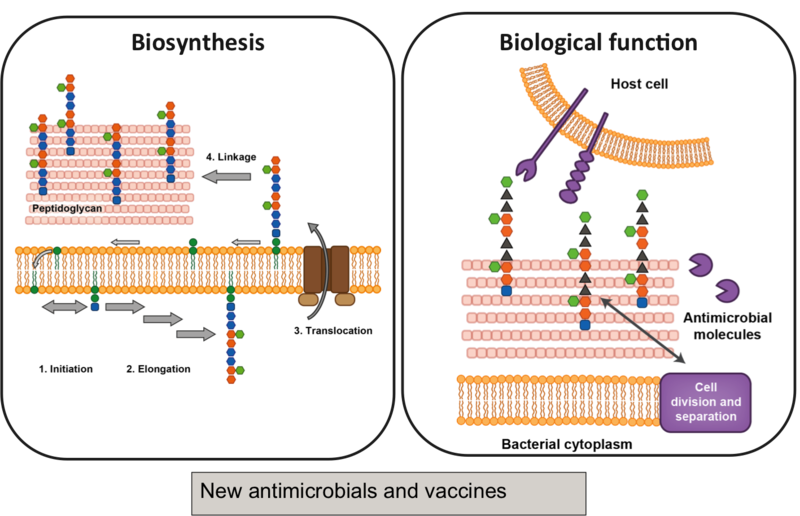 The molecular mechanism for these virulence-enhancing mechanisms has not been fully elucidated, but insight could open new pathways for selective anti-virulence strategies or vaccine targets to combat these deadly infections. Investigate application of streptococcal carbohydrates as vaccine antigens. Tong SY, Davis JS, Eichenberger E et al. Staphylococcus aureus infections: epidemiology, pathophysiology, clinical manifestations, and management. Clin Microbiol Rev 2015; 28: 603-661. Walker MJ, Barnett TC, McArthur JD et al. Disease manifestations and pathogenic mechanisms of Group A Streptococcus. Clin Microbiol Rev 2014; 27: 264-301. McCarty M. The lysis of Group A hemolytic streptococci by extracellular enzymes of Streptomyces albus. II. Nature of the cellular substrate attacked by the lytic enzymes. The Journal of experimental medicine 1952; 96: 569-580.
van Sorge NM, Cole JN, Kuipers K et al. The classical lancefield antigen of Group A Streptococcus is a virulence determinant with implications for vaccine design. Cell Host Microbe 2014; 15: 729-740. Hazenbos WL, Kajihara KK, Vandlen R et al. Novel staphylococcal glycosyltransferases SdgA and SdgB mediate immunogenicity and protection of virulence-associated cell wall proteins. PLoS Pathog 2013; 9: e1003653. Thomer L, Becker S, Emolo C et al. N-acetylglucosaminylation of serine-aspartate repeat proteins promotes Staphylococcus aureus bloodstream infection. J Biol Chem 2014; 289: 3478-3486. Weidenmaier C, Kokai-Kun JF, Kristian SA et al. Role of teichoic acids in Staphylococcus aureus nasal colonization, a major risk factor in nosocomial infections. Nat Med 2004; 10: 243-245. Weidenmaier C, Peschel A, Xiong YQ et al. Lack of wall teichoic acids in Staphylococcus aureus leads to reduced interactions with endothelial cells and to attenuated virulence in a rabbit model of endocarditis. J Infect Dis 2005; 191: 1771-1777.